Nutritional status in children with cancer is an important prognostic factor. Assessment consisting of anthropometry, biochemistry, clinical, and diet that needs to be done on diagnosis and regularly to ensure that patient's nutritional status does not deteriorate. In developing countries, assessment will depend on the availability of all resources, but monitoring is essential. The development of malnutrition during treatment is possible and the reasons are multifactorial. Nutrition plays a deciding role and a key factor in children with cancer and can influence their outcome. Adequate nutrition in childhood is important to ensure proper neurodevelopment, a functional immune system, quality of life and in case of illness, response to the treatment given. In children with cancer, their nutritional status on diagnosis is very important because it has an impact on their outcome. Children treated in a pediatric oncology unit's nutritional status need to be assessed on a regular basis to ensure adequate growth, maintenance of nutritional status, and tolerance to treatment. Nutritional assessment involves anthropometry, biochemistry, clinical, and diet history and the following are recommended. Clinical assessment is an important tool that indicates signs known to malnutrition/nutrition deficiencies in patients as well as physical signs that might influence dietary intake., It also includes patient's history, social-economic, cultural and environmental status of the patient. The side effects of the treatment are part of the clinical assessment and it needs to be done daily while patient on treatment in hospital or seen at the clinic. Diet history includes surveys of the quantity and frequency of food consumed during the past week at home and/or other hospital. It is also important to help determine the food security at home and the availability of variety of food items. This is one of the challenges experienced in an oncology unit because parents are faced with a diagnosis of cancer and cannot recall what and how much their children ate before admission. One recommendation is to ask a summary what the child ate the past 2 days and then do full assessment a week or two later when parents are more settled in the unit. About 46% of children diagnosed with cancer are malnourished , and this leads to a change in their body composition  that can influence drug metabolism and increase their risk for infections. Patients that receive corticosteroids as part of their treatment experience an increase in appetite, especially cravings for fatty food high in sodium that leads to an increase in adipose tissue, but decrease in lean body mass.,, Patients are also scared of vomiting, learn food aversions and therefore their oral intake can decrease, leading to nutritional status that deteriorates. It is also known that parents and/or patients do not always follow nutritional advice given to them by dieticians, doctors, or nursing personnel. Children get caught up in this situation of going to hospital and receiving treatment and so lose total control of their lives. Often, the only thing they can control is the types of foods they are willing to consume. This may lead them to manipulate their caregivers to give them whatever they want to eat, what is most of the time not healthy food. Monitoring patient's nutritional status is the most important role of a dietician in a unit because if a patient's nutritional status deteriorates, it can influence the outcome. Anthropometry needs to be repeated at least once in 2 weeks while on treatment, either in- or out-patients. Biochemistry needs to be evaluated when repeated for medical purposes and to request that special tests be done if necessary. Clinical assessment is done on a daily basis to assess if patients are vomiting, have diarrhea, are constipated, or have edema. Diet intake should be monitored daily and if a patient is eating <70% of their nutritional requirements, a nasogastric (NG) tube should be inserted for enteral feeds to maintain or improve a patient's nutritional status. A patient on NG-feeds should be monitored daily. Patients that are well enough can go home between treatments, for a weekend or sometimes a week. On discharge, the patients' nutritional status will be determined and decided if nutritional supplements can be given home or not. Due to budget constraints, not all patients can receive supplements. There are still a significant number of people suffering from hunger and malnutrition in poor-and middle-income countries; in fact, between 2000 and 2005, the number of undernourished and underweight children in Africa and Asia increased. The possibility of patients coming from very poor social-economic background and food insecurity is therefore high; the Ideal would be to give food parcels home to those patients. Support groups such as nonprofit companies can play a role here by collecting food parcels for homecare, but there is always the problem that we do not know how food is divided in a family. In HIV patients, food parcels with nutritional supplements were sent home, and the conclusion was that the family benefitted from the food parcels, and the supplements were used for the individual patient. Advice on how to enrich food items with protein and energy must be given as well to ensure adequate nutrient intake at home. The reason children with cancer become malnourished during treatment is multifactorial. The altered metabolism is due to the oxidation of energy substrates that leads to loss in body protein and nutrient losses that cause gastrointestinal tumor problems. Pain or stress, hormonal and inflammatory components, psychological problems, low physical activity, taste aversions, and chronic medications are all reasons for decreased oral intake and can contribute to the development of malnutrition.,,, In [Table 6], the factors contributing to cancer cachexia are explained in detail. The nutritional status of pediatric oncology patients at diagnosis can have an effect on outcome, therefore it is extremely important that their nutritional status be maintained or improved during treatment. Assessment needs to be done regularly to determine if there were any deterioration in their nutritional status since last assessed and then the proper nutritional intervention is needed. In units with lack of resources, the patients at high risk for malnutrition should be prioritized and assessed at diagnosis and follow-up throughout treatment to ensure well-being of these patients. It is clear that nutritional support should be a major part of supportive care to prevent or reverse malnutrition and increase well-being of children with cancer. Rodgers PC, Schoeman J. Nutritional assessment and intervention. In: Stefan DC, Rodriguez-Galindo C, editors. Pediatric Hematology-Oncology in Countries with Limited Resources. New York: Springer. p. 91-112.
WHO Antro 2005. Software for Assessing Growth and Development of the World's Children. Geneva: WHO; 2011. Available from: http://www.who.int/childgrowth/software/en. [Last accessed on 2016 Jan 02], [Lats updated on 2011 Jan], [Lats cited on 2014 Aug 22]. International Myeloma Foundation. Understanding Dexamethasone and Other Steroids; 2007. Available from: http://www.myeloma.org. [Last accessed on 2016 Jan 02], [Last cited on 2015 Mar 26]. Bauer J, Jürgens H, Frühwald MC. Important aspects of nutrition in children with cancer. Adv Nutr 2011;2:67-77. Schoeman J, Dannhauser A, Kruger M. Malnutrition in paediatric oncology patients. CME 2010;28:385-8. Lee RD, Nieman DC. Nutritional Assessment. New York: McGraw Hill; 2010. Chapter 1, p. 1-3; Chapter 3, p. 74-88; Chapter 6, p. 163-87; Chapter 7, p. 219-25; Chapter 9, p. 304-31; Chapter 10, p. 338-50. [Last accessed on 2016 Jan 02]. Israels T, Renner L, Hendricks M, Hesseling P, Howard S, Molyneux E; Paediatric Oncology in Developing Countries. SIOP PODC: Recommendations for supportive care of children with cancer in a low-income setting. Pediatr Blood Cancer 2013;60:899-904. Lab Results: What Do They Mean? ; 2013. Available from: http://www.nutrition411.com/oncology-for-your-patients/miscellaneous/item/28507-l. [Last accessed on 2016 Jan 02], [Last cited on 2014 Aug 21]. Duggan C, Watkins JB, Walker. Nutrition in Pediatrics. Clinical Assessment of Nutritional Status. 4th ed. Cha. 2. Hamilton, Ontario, Canada: BC Decker Inc.; 2008. p. 6-13. Gibson F, Soanes L. Cancer in Children and Young People. England: John Wiley and Sons, Ltd.; 2008. Zilva JF, Pannall PR, Mayne PD. Clinical Chemistry in Diagnosis and Treatment. 5th ed. London: Lloyd-Luke (Medical Books) Ltd.; 1988. Chapter 1-3, p. 1-75; Chapter 9, p. 172-208; Chapter 15, p. 307-22; Chapter 19, p. 379-87. Cartwright C. Medical nutrition Therapy - Paediatric Oncology. St. Jude Affiliate Program Annual Conference. Hands that Serve, Hearts that Care; 16-17 August, 2013. Collins L, Nayiager T, Doring N, Kennedy C, Webber C, Halton J, et al. Nutritional status at diagnosis in children with cancer I. An assessment by dietary recall – Compared with body mass index and body composition measured by dual energy X-ray absorptiometry. J Pediatr Hematol Oncol 2010;32:e299-303. Co-Reyes E, Li R, Huh W, Chandra J. Malnutrition and obesity in pediatric oncology patients: Causes, consequences, and interventions. Pediatr Blood Cancer 2012;59:1160-7. American Cancer Association. Nutrition for Children with Cancer; 2011. Available from: http://www.cancer.org. [Last accessed on 2016 Jan 02], [Last updated on 2011 Jul 06], [Lats cited on 2011 Jul 24]. Galati PC, Resende CM, Salomão RG, Scridelli CA, Tone LG, Monteiro JP. Accurate determination of energy needs in children and adolescents with cancer. Nutr Cancer 2011;63:306-13.
den Broeder E, Lippens RJ, van't Hof MA, Tolboom JJ, Sengers RC, van den Berg AM, et al. Nasogastric tube feeding in children with cancer: The effect of two different formulas on weight, body composition, and serum protein concentrations. JPEN J Parenter Enteral Nutr 2000;24:351-60. Delbecque-Boussard L, Gottrand F, Ategbo S, Nelken B, Mazingue F, Vic P, et al. Nutritional status of children with acute lymphoblastic leukemia: A longitudinal study. Am J Clin Nutr 1997;65:95-100. Schoeman J. The Effect of the Nutritional Status of Paediatric Patients with Cancer at Diagnosis on Disease Outcome. [MSc Thesis – Dietetics]. Pretoria, Kitskopie, Qld: University of the Free; 2009. Joint WHO/FAO/UNU Expert Consultation. 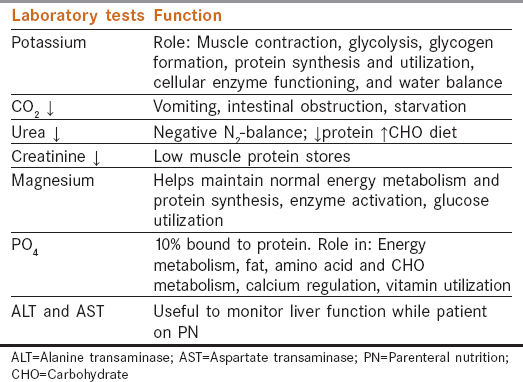 Protein and amino acid requirements in human nutrition. World Health Organ Tech Rep Ser 2007;935:1-265. ASPEN 2010 Recommendations for Protein; 2010. Available from: http://www.nutritioncare.org/Clinical_Practice_Library/. [Last accessed on 2016 Jan 02], [Last cited on 2014 Aug 21], [Last cited on 2014 Aug 8]. Food and Nutrition Board. Dietary Reference Intakes for Energy, Carbohydrate, Fiber, Fat, Fatty Acids, Cholesterol, Protein, and Amino Acids. Available from: http://www.nal.usda.gov/fnic/DRI/DRI./recommended_intakes_individuals.pd. [Last accessed on 2016 Jan 02]. Nutrition Daily Allowance for Children; 2000 Available from: http://www.nutrition.com.sg/he/herda-chd.asp. [Last accessed on 2016 Jan 02], [Last cited on 2014 Aug 22]. Steroids. Radiotherapy Patient Information; 2014. Available from: http://www.rooj.com/Steroids.htm. [Last accessed on 2016 Jan 02], [Last cited on 2015 Mar 14]. Steroids. Free Help For Cancer.© Copyright 2009 Free Help For Cancer. All Rights Reserved. Available from: http://www.freehelpforcancer.com/manages-meds/steriods. [Last accessed on 2016 Jan 02]. Selwood K, Ward E, Gibson F. Assessment and management of nutritional challenges in children's cancer care: A survey of current practice in the United Kingdom. Eur J Oncol Nurs 2010;14:439-46. Blunt M. Chemotherapy, cakes an cancer: An A to Z living with childhood cancer. CLIC Sargent 2005. Belahsen R. Nutrition transition and food sustainability. Proc Nutr Soc 2014;73:385-8. doi”10.1017./SOO29665114000135. Ivers LC, Cullen KA, Freedberg KA, Block S, Coates J, Webb P. HIV/AIDS, undernutrition, and food insecurity. Clin Infect Dis 2009;49:1096-102. Murphy AJ, White M, Davies PS. Body composition of children with cancer. Am J Clin Nutr 2010;92:55-60.